My Base Network map from Radio Mobile showing Unit locations and signal strengths by Link colour. The pictures were generated using my 'Quick Start' Base Network for an area of the UK Peak District. An Installer for the latest version of the program 'Radio_Mobile_Setup.exe' is available Here, or from the 'Quick Start' and Downloads pages. It is a simple task to move your map area to any location in the world, and my installer provides a working program which is complete with all the internal links generated to make it perform correctly when installed. The Base Network Unit locations shown have been overlaid on an elevation map with contours, generated from data collected by the Space Shuttle Radar Terrain Mapping Mission. 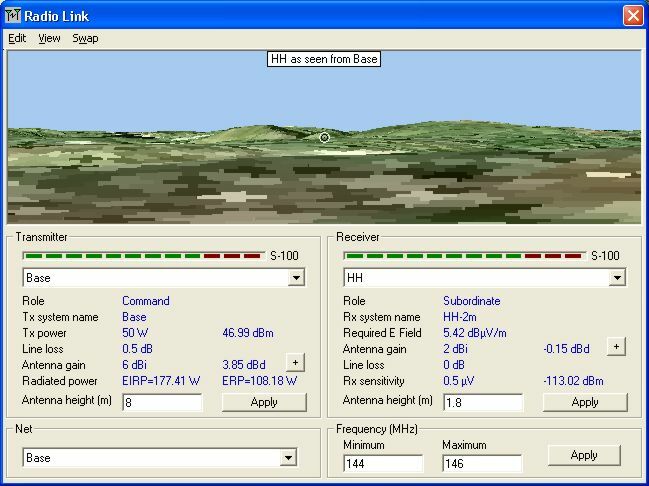 Radio Link parameters between selected Units can be examined using the Radio Link pane, with an elevation grid displayed if required. This grid shows the height matrix round the cursor cross wires and can also include a magnified view of the cursor location if required. 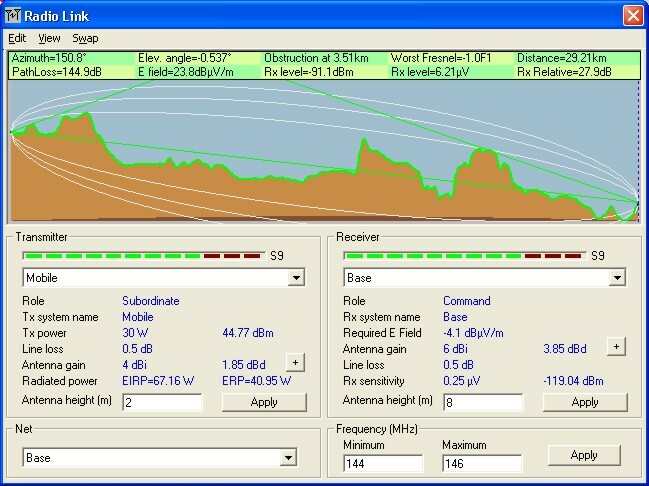 Individual Radio Link performances between pairs of Units can be selected and displayed by the program, with the ground profile and other Link parameters being displayed. 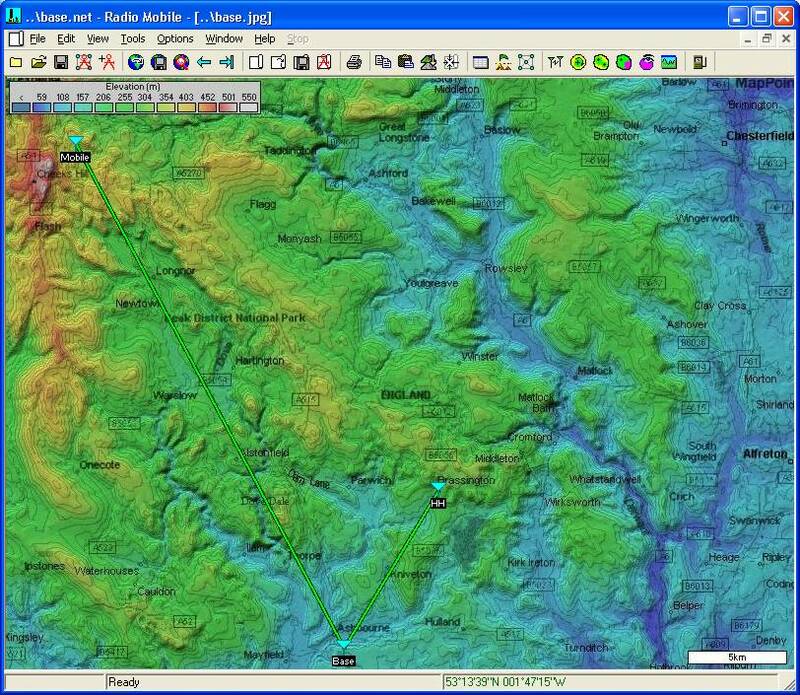 Land Coverage data can also be downloaded and then included in the propagation path calculations. 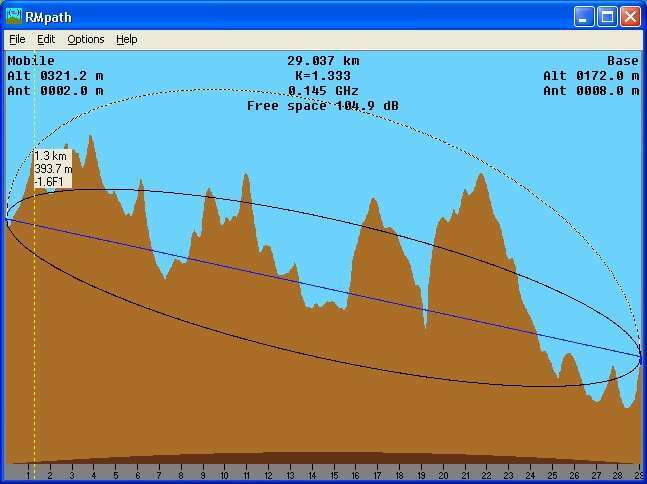 Link characteristics and elevation data with selected Fresnel zones. It is also possible to View one Unit from another! 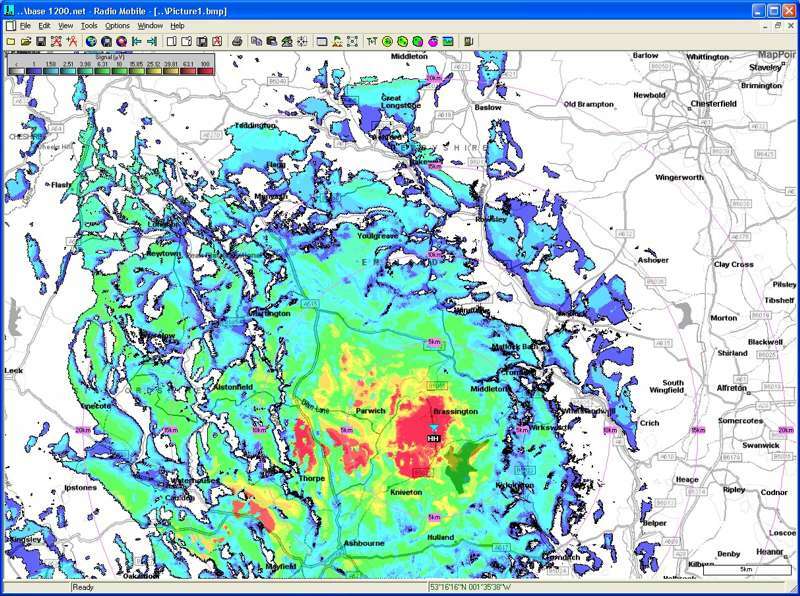 The pane below shows a 40˚ view over the elevation map, where the visible Unit is shown by a circle. where the Hand Held Unit is shown again with a location ring as it is visible. 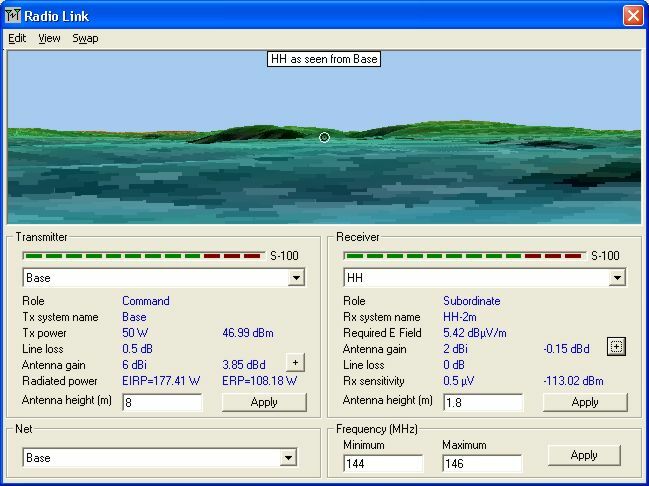 Coverage signal strengths in various units can be also be computed for any Unit if required, and radial range rings added. This has been performed over a 'Greyscale' road map for clarity. 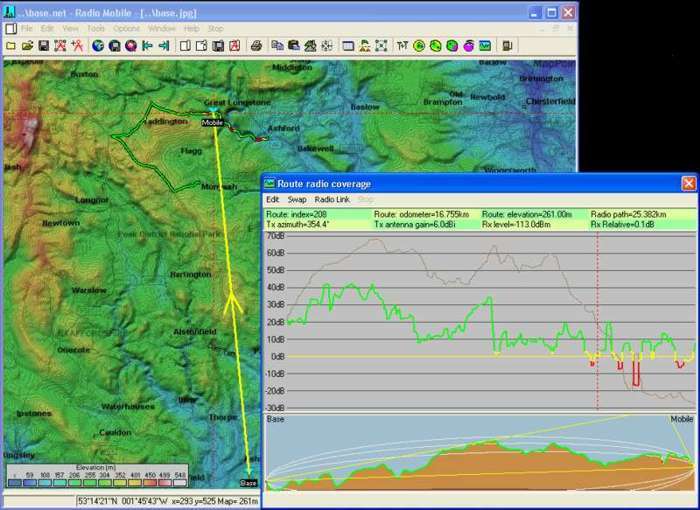 Radio Coverage along a defined Route can also be plotted between a fixed Unit and a defined Mobile Unit as it traverses the Route, with signal levels shown on the Route Radio Coverage pane. The Green line shows signal levels ≥ 3dB above receiver threshold, changing to Yellow at ± 3dB, and Red ≤ -3dB. In the background is a Route elevation plot in Brown, changing to Blue when there is a visible path between the selected Units.